How to debug runtime syntax error in Excel VBA? Regardless of which button I click (Yes or No), the script continues to run normally and everything is OK (i.e., all content is properly loaded into Excel). However, I would like to prevent this error from popping up in the first place since it is bad user experience to have this pop up while the macro is running. The VBA project doesn't even have 344 lines, so I'm not sure which line the error is referring to. 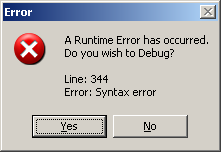 Does anybody have a clue how I can fix this, or at least prevent this error dialog from showing up? To fix this I had to save XMLHttpReq.responseText to a variable, modify the source code so that it's valid HTML, then assign it to HTMLDoc. Thank you all for those who took the time to reply. can you use on error resume next right before the line which may cause this error, then on error goto 0 after you are done? This requires that you identify which call to that XMLHTTP may cause trouble, which, i don't know, debug.print everywhere and see which line can be a trouble?